Two tracks of 1980s bedroom drum machine soul. 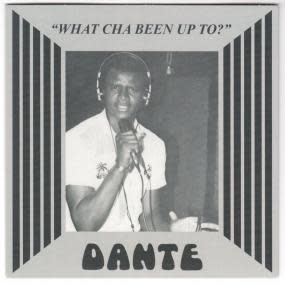 These songs were recorded to four track by teenage brothers Dante and Tyrone at their home in Philadelphia. 500 copies on this lovely 45 with not a chance on a repress apparently.. What Cha Been Up To is a future classic soul ballad with swooping synthesizer and heart wrenching vocals. No Parking On The Dancefloor is a Friday night anthem with driving synth drums, day dream lyrics, and that hook!